You know that beautiful cashmere sweater; solid, simple and luxuriously soft? It’s a staple in any fashion conscious women’s closet. It feels great to wear, but the look is just OK, if not a bit boring. By adding a simple accessory, you can transform a drab outfit to a show-stopping, fashionable getup. Here are four quick and easy ways of accessorizing those basic, yet essential sweaters and dresses which will change your outfit from blah to absolutely beautiful! Not just any necklace, but something bold and unique that will make a statement. A piece that will bring your outfit to the next level. You can dress up a denim shirt, simple sweatshirt, or even color-coded scrubs with something glam and sparkly, or a beautiful brightly colored piece. This looks really amazing when wearing the same color top and pants. Add a touch of elegance with a beautiful scarf, or a fun spin with a cute, chic one. Coming in different shapes and a plethora of colors and prints, all you need is a quick wrap, and you got yourself looking sophisticated and stylish. Adding a belt to a dress or skirt is a simple way to look effortlessly chic and fashionable. Just be careful to choose a style that fits your personality, and make sure the dress doesn’t have too much fabric, which will cause bunching and make you look sloppy. Thankfully your belt can even be a beg with today’s trend forecast! And there are numerous ways to combine it with your outfit today, the most simple rule when it comes to it is the one saying there aren’t any. Fashion Tip: Match your belt color to the color of your shoes for a super classy, conservative look. Mismatching them will give off a more casual and fun vibe. Sometimes all you need is a fashionable handbag to make you look chic, sophisticated and beautiful. In fact, it is such an important fashion piece, and gives off such a strong impression, that one woman said the bag she brought to her interview was what secured her job! No matter what a classic bag is a timeless investment. Even if it goes out of trend it is bound to come back into the trend-mill. If anything holding on to a designer bag is only to bring up the value of the same. So, go ahead and add a statement accessory or two to your wardrobe today and start accepting the compliments! 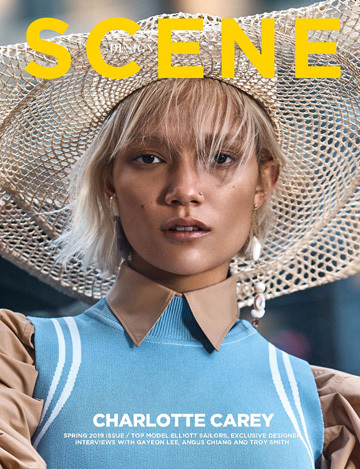 All images from our online exclusive captured for DESIGN SCENE STYLE stories with models Tijana Zlaticanin & Avril Guerrero photographed by Amr Ezzeldinn – see the full shoot.